It starts with torrential rain in the mountains. Then a wall of mud and boulders comes barreling down the slopes, sweeping away houses, cars and people. Like a video stuck on repeat, the story has played out over and over again in recent weeks in South America, where hundreds of people have been killed in landslides. First they hit Peru, where the indigenous Quechua language has a word for these flash flood-landslides: "huaycos." 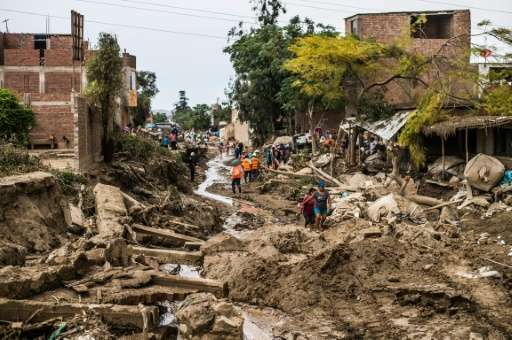 More than 100 people have been killed since the start of the year in flooding and landslides in Peru, and more than 100,000 have lost homes or otherwise been affected. 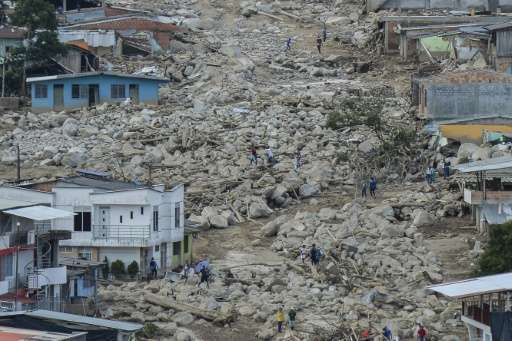 In Colombia, the devastation is even worse. The southern town of Mocoa was hit by an enormous landslide Friday that killed 262 people, including 43 children. Why do these natural disasters occur? And why is South America being hit so hard right now? "Nature has always been like this. Our ancestors understood it better than we do today," said Peruvian architect Augusto Ortiz de Zevallos. "Just look at the archaeological sites that remain, sheltered from the onslaught of water," he told AFP. Modernization has led to forests being replaced by farms, eliminating the natural barriers that restrain the water from torrential rains. "During the (floods) of 2010 and 2011... 71 percent of the flooding happened in pasture land that had lost its trees," the head of the weather warning system for the Colombian meteorological institute, Christian Euscategui, told newspaper El Tiempo. Colombia's weather authorities, who keep a close eye on deforestation, say it slowed by 12 percent in 2015. But that still meant forest losses of more than 124,000 hectares (475 square miles). Global warming, which is melting the region's glaciers, is also driving the problem. "Climate change is generating dynamics and we see the tremendous results in terms of intensity, frequency and magnitude of these natural effects, as we have just seen in Mocoa," said Martin Santiago, UN chief for Colombia. Experts say chaotic urbanization is also to blame. Mocoa's population was swollen by poor migrants and especially people uprooted by Colombia's half-century civil war. These displaced residents and their often precarious houses were hit especially hard by the disaster. "The centralization of society means people try to move closer to cities, no matter where it is, without considering whether a river used to flow there or if it's a ravine where rain accumulates," said architect Ortiz de Zevallos. In the case of Mocoa, the town "was the victim of a lack of urban planning," said Colombian ecologist Rodrigo Botero. "That's the case in nearly every region of Colombia." Even Mocoa's own mayor, Jose Antonio Castro, said it "is not a place where a town should be," because of all the rivers surrounding it. Three of them flooded Friday, triggering the landslide. In the Peruvian capital Lima—also hit hard recently by flooding and landslides—Mayor Luis Castaneda said nature "got the better of engineering." But that misses the whole point, said Ortiz de Zevallos. "Engineering is about understanding nature," like the ancient Incas did, said the architect. The bishop of Mocoa, Luis Maldonado, had his own take when asked if God had abandoned the town's people. "God always forgives, man sometimes does, but nature doesn't forgive," he said. The central authorities warned them 9 months ago this was a problem. Exactly this. "The director of the environmental authority said that following the early warning, Mocoa failed to make provision in its Plan of Territorial Order (POT) to prevent the disaster. "A workshop was held with the Colombian Geological Service where they mentioned and warned about inadequate settlements in certain areas," said Mejia adding that "it is a subject of inappropriate use of the soil that aggravates these type of events. Nine months ago, studies revealed that something like this could happen." -Colombia Reports. Those who ignored the wornings should be punished.